Here's what some folks say about us! This years hunt in the Outer Banks was one for the record books. Although some of the shooting was less than stellar, there were some shots that will live in my memory for a long time. The next group of birds that came in were Green Winged Teal. There were around 20 birds in this flock and I scratched one down that dropped in the decoys and Dave Dropped another that sailed out into the marsh. We sent Beau into the marsh but could not locate the bird so we got the other bird before it drifted out into the sound. After a short while Matt asked if he could take Beau back out an look for the lost bird. I was thinking that the duck had run off but said yes because there was always a chance that we had not checked the right area because I did not see the bird drop and Beau was working mostly with me. A couple of minutes later Dave and I heard a large “WOOP” from Matt as Beau located the bird around 50 yards from where we were searching and to add frosting to the cake, the Greenwing Teal was banded! As in most blinds there is always a “discussion” on who should get the band. It is always a big deal to add some “bling” to the call lanyard and this was no different. As Matt had the boat and was our only way back to dry land it was decided that he should get the band, and he took it with reverence. The rest of the day went like a dream and we collected four Green Wing Teal, six Greater Scaup, a Black Duck, and a Gadwall. Another day that will live in my memory for many years to come. Beau did not dissapoint… He’s my bud…. I would like to thank Matt for putting me at ease and even asking to work with Beau on a few retrieves. You can always tell a dog man when you see them. He is one of the best that I’ve met. I WILL be hunting with him again! The second day dawned chilly and windy. A kind of day that you know the birds will want to move in to stay warm. This day Dave and I were hunting with Vic Berg, the owner of “Outer Banks Waterfowl” in the Oregon Inlet on his marsh where you get a great view of Bodie lighthouse. This area covers vast areas of ankle to knee deep water with grass that the ducks love to dine on. As we were waiting for shooting time we could hear Gadwalls, Teal, Pintails, Swans, and Wigeon calling all around us. I had a good idea that this was going to be another great day. The only glitch in this scenario is that the area that I normally hunt in Michigan is similar and I quite often have trouble getting “Mr. 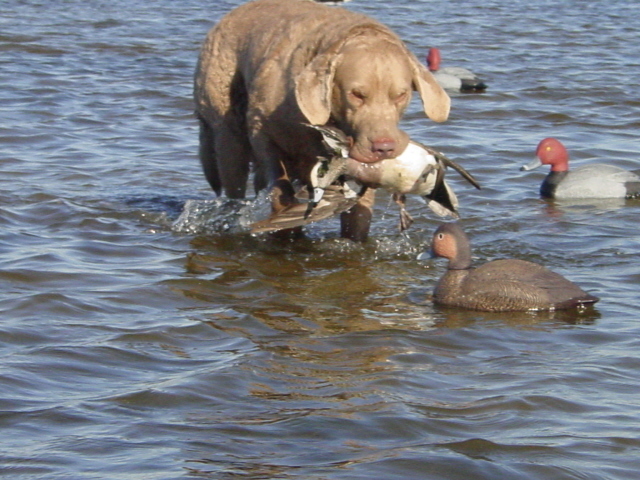 Chesapeake” to want to retrieve the ducks without poking and playing with the ducks before HE decides it is time to retrieve them. Today was no exception… After while, on one of the retrieves, I decided not to go out and do a photo shoot and remained in the blind as I needed to dig for more shells. Beau RAN out of the blind, picked up the bird, and RAN back to the blind with the duck gently cradled in his mouth. Go figure… I still wonder who was training whom…. The day ended well as we ended up with a dozen ducks consisting of Pintail, Gadwall. Ringnecks,Scaup, and Widgeon. 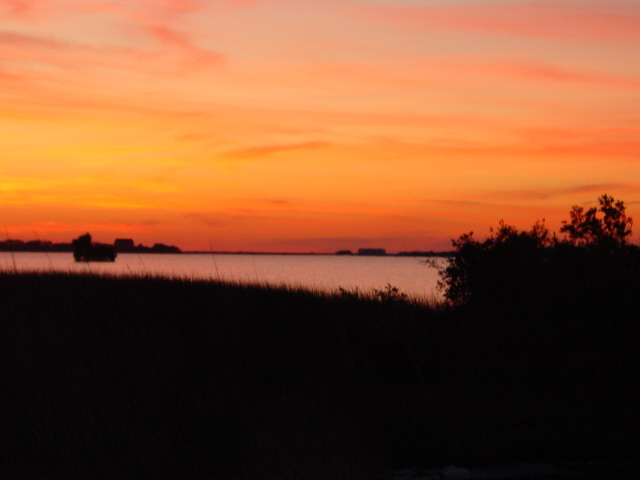 With a gorgeous sunset and Tundra Swans settling in outside the decoys, we ended two days of fantastic waterflowling. Good times, good friends, and a good dog. For as long as I live, it is going to be really hard to repeat these two days. I am blessed. The dinner at Kellys was FANTASTIC!! They even gave us the recipe for the sauces. The duck was not over cooked and wrapped in bacon for that extra pleasant taste. I was pleasantly surprised and I just might do that again next year! I want to thank you for the great hunt a couple of weeks ago. Graham was a lot of fun and treated me right. Is it too early to line up a hunt for next year? I’d like to hunt three or four days and I may need a one day break between one or two of the days. I don’t know if you have any openings during the last couple weeks this month. If so, I may come back down. Just wanted to drop you a note to tell Thank You Ethen and myself really enjoyed the duck hunting last week Jeff and less were to great guys to hunt with. I really enjoyed the 2nd day because i love hunting puddle ducks i got away from duck hunting for a few years because i had no places to hunt last week reminded me just how much i loved it and it was great to hunt with two guides that have such a passion for what they do.I have two pintails to mount now and i can’t wait to get back down and do some more hunting. Here is my deposit for the January 14th,15th hunt I booked with Ellen the other day. As always, Dad, Daisy and myself are looking forward to the trip. I realized after talking with Ellen the other day, that this will be my 9th year and 10th season of hunting with y’all! This season, with trips booked to TX, TN, NC, FA and CA, I stand an excellent chance to complete my collection of North America’s 32 ducks. I consider myself so fortunate to have met you, Ellen and all the guides I’ve hunted with up on the Outer Banks over these past years. The variety of the beautiful ducks there, along with the knowledge that you and your guys have shared with me in the marsh have been invaluable. I’ll forever cherish that knowledge along with all the wonderful memories! Hello. 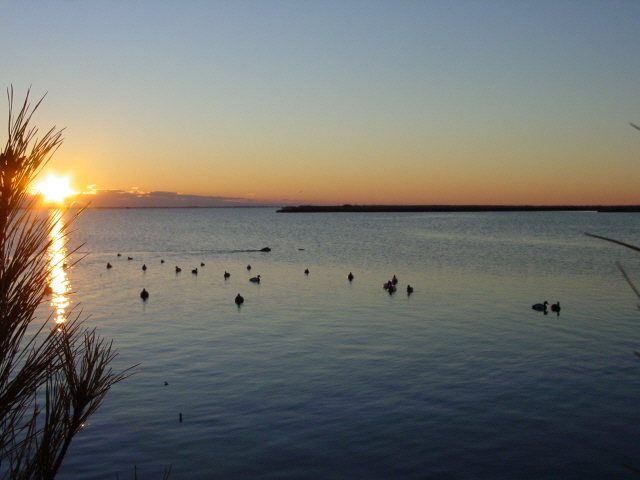 My mind turned to hunting for a few minutes this morning, so I clicked on the internet, and perused my way to the Outerbanks Waterfowl site. I was reading through the weekly log, and came to this Feb. 17 entry and whaddayaknow? 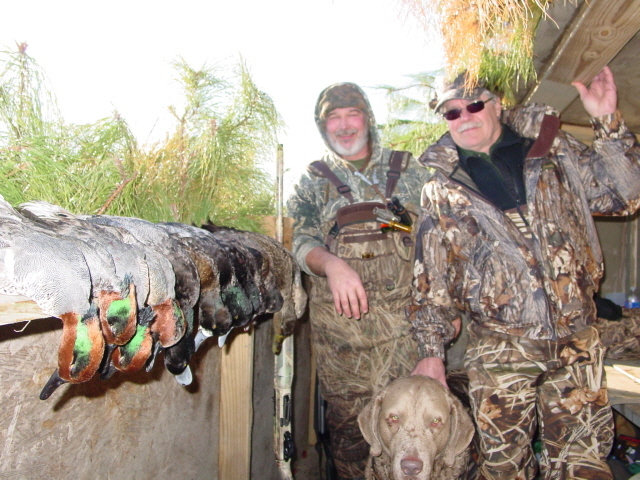 Our hunt with Les is the first mentioned, and declared “best day south of Oregon Inlet”. That’s alright by me, and pretty daggum neat to see. How’s this for a day’s total bag? Best day south of Oregon Inlet: 1/22/10. Six red heads, 3 drake pintail, six widgeon (one of which is a Eurasian widgeon), a blue bill, 2 big male American black scoters and 4 brant. To top the day off, they’re limited by noon and one of the brant has a band on each leg. The theme of that morning was “epic”, as it truly had all of the right ingredients for a hunt that will live in the minds of the hunters for years to come. One that will be recalled as a day when all of the pieces of the waterfowling puzzle were aligned perfectly. Les was made a hero that day, and I hope the time comes when we can share a blind again. The wind had turned and was blowing hard, the blind was re-located perfectly, the decoy placement was precise and effective, and the birds came. We rose in unison to knots of Pintail at first, then Widgeon, Scoter, Brant, Blackheads, and Redheads. Without a word spoken, we picked our birds based on our position in the blind; the lead man always allowing the groups of decoying fowl to get those few extra yards to provide shot opportunities for all. Then we capitalized, and I can say that very few shots missed the mark that morning. Les even managed a true Scotch double that we all agreed was a fitting ending, as it filled his limit (we, the fares, were happy to watch as our straps were already full). Les’s decoy placement was spot-on, and the birds repeatedly were at 10-25 yards back-peddling into the rig, affording us the opportunity to choose the biggest bull Pintails, and take a bag that was heavy to drakes. Then, the redheads made their appearance. A small group here, a little larger flock there, then came what seemed like every member of the clan that had made their way to the sound that winter. Stretched out for half a mile came flock after flock of redheads. That view of the skyline over the open water will be one that I can recall in my mind’s eye for years to come. As if the sheer numbers and scenery in sight from that bobbing float blind were not enough, the hunt rewarded us with certain rarities that further implant this experience in our memory. One group of a dozen or so Widgeon decoyed, and at the bottom of the flock, separate from the American Widgeon was a bird that stood out with a red head and breast. It was clear as a bell hanging below the main knot of birds, and drew my focus and shot. It was and remains the only Eurasion Widgeon I have ever laid eyes and hands upon. As if that bird was not enough of a rarity, we also managed to each bag a Brant, one just happened to be banded – on both legs! Truly a hunt for the ages. It was a season to remember for us last year, and this particular hunt was no small part of that. A hunt that inspired a decoy. My first and only attempt at carving a Redhead gunner. The second morning in Oregon Inlet, was not as glamorous. Our guide for the day, Matt, was not as fortunate with regards to weather conditions, and we wound up with a “meager” bag of two Redheads and two Widgeon to show for an all day effort. The birds just weren’t moving as well, and the wind had died down. Fortunately, that morning, the only miss was a Bufflehead that we never saw coming, but we all got to watch him leave after 8 shots clued him in to the presence of hunters. That’s duck hunting, though, and the reason we come back to it year after year- to pick up where we left off, to try again and again, to get all the parts of the equation just so, in hopes that the day will yield memories that will survive the seasons ahead. We retreated back south to hunt the flooded cutovers and cypress swamps provided by the swollen rivers in our area to finish out the last week of the season gunning Wood Ducks dipping and dodging their way in through the canopies, but then again a half dozen Summer Ducks in 15 minutes of hunting has its place as well. Good times! Thanks again, all. I thought, perhaps a photo may be of use to you. 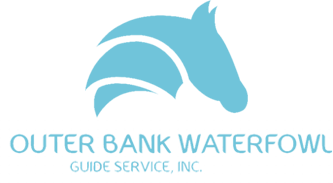 I hope I haven’t bored you with my recollection and email, I just wanted to convey to you my appreciation and enjoyment resulting from our brief time spent with the guides at Outerbanks Watefowl. I truly hope to spend another day in a blind with Les Toler, because when you take away all of the circumstance, the uncontrollable aspects of any duck hunt, he was a pleasure to hunt with and knew his game well. He is an asset to your operation. I look forward to reading more on your Alaska adventure.